We started 2016 with high hopes to put Nirvana back in the water the first week of January. At just over a year in the boatyard, we were past the point of being ready for a slip in the marina. Boats and boat work seem to have their own schedule, however. Ken and I were excited to be at the boatyard that first week of January, giving the owner notice that we'd need him to put Nirvana in the sling later that afternoon. Ken added a few cleats to the deck for docking, changed a valve and made all the last minute preparations for splashing. We were just about ready to put Nirvana in the sling ... until Ken noticed something. 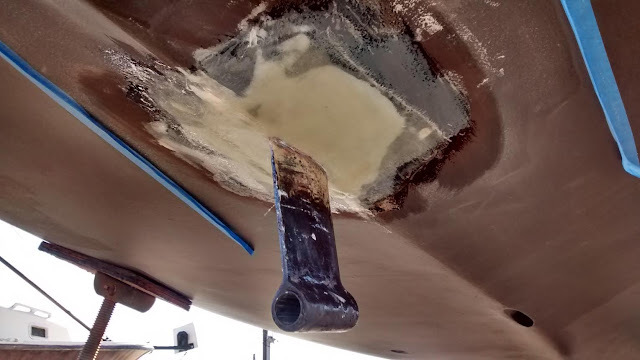 A small trickle of water was coming from the strut, which is located underneath the boat and holds the propeller shaft. 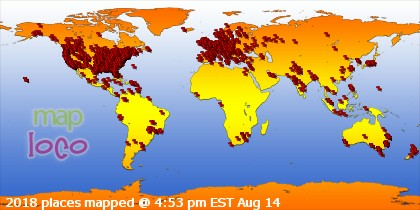 This was not good. If water can find its way out of the boat, it can probably find its way inside. The strut and bolts were tightened the last time Nirvana was on the hard, and although the strut was still tight this required attention. 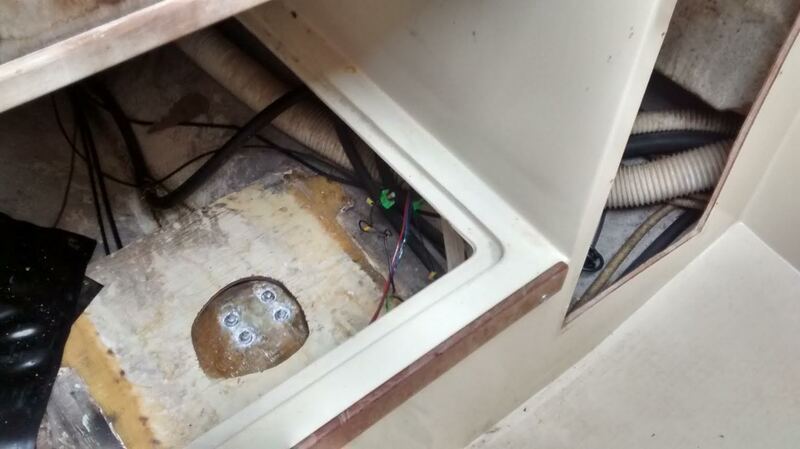 Getting to the bolts is not an easy task, and just getting to the bolts from inside the boat is a royal PITA. 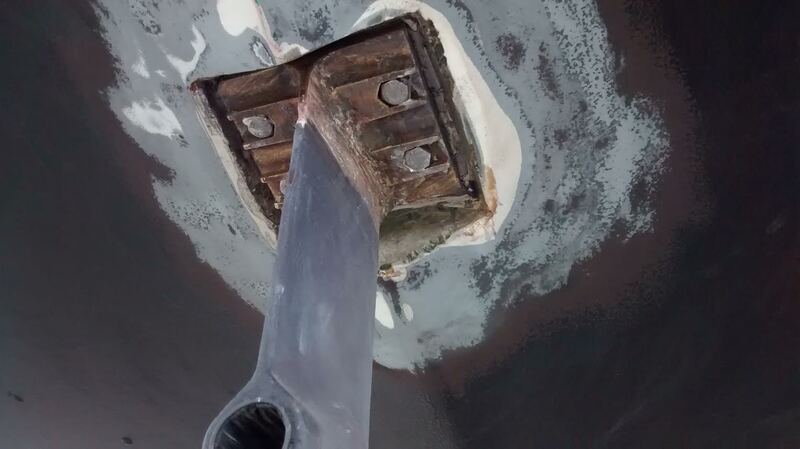 The bolts are located underneath a layer of fiberglass, which is located underneath the fuel tank in the quarter berth. This means emptying the fuel tank, removing the tank, then chipping away at the fiberglass over the bolts. It also means removing one of the galley cabinets. Then there's the exterior ... the filler needs to be removed to get to the bolts. Didn't we already do this?! Anyway, Ken handled the situation surprisingly well and we didn't splash that day. In one way we were lucky, as there was a small leak into the boat that caused us to notice the trickle of water. If the boat hadn't leaked and held water where it did ... we wouldn't have known that the strut and bolts needed attention. Since then, Ken has done all of the above steps in fixing the situation ... removing the cabinet and fuel tank was the first step. See that piece of wood with that mound of fiberglass that Ken had to chip away at? He then removed and replaced the bolts. The bolts were bedded with 5200, then the exterior was filled with a mix of marine filler and fiberglass. Once that was complete, Ken sanded the area (first picture) then added epoxy and a couple layers of fiberglass cloth. All of this had to be coordinated with the weather, as epoxy doesn't like the cold. This past weekend we were able to finish the project and the next step will be skimming the area with filler then priming and painting the area. 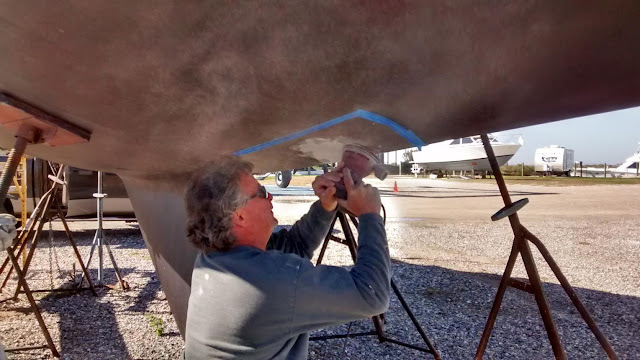 Ken will also add fiberglass back over the interior side of the bolts, install the fuel tank ... and try to find the source of that dang leak! As I mentioned earlier, we had high hopes that Nirvana would be sitting in a slip at the local marina by now. In fact, we were so confident that our days at the boatyard were over that we made other arrangements for the rest of this week. We have some fun things planned (details in next post) through the weekend, but if we'd known that we would STILL be in the boatyard ... we wouldn't have made such plans. Oh well, we might as well make the best of things and have a good time. Hopefully, next week we'll find ourselves back at the boatyard ... and finally splashing. We're hoping that once Nirvana is in the marina, we won't feel as pressured with repairs. Paying the monthly storage fee for over a year can get pretty old .. and expensive. Maybe we need some fun anyways ... yesterday I received a call from one of our long-time tenants stating that she hospitalized her husband for drug addiction and that she was moving ASAP because she didn't want the drug dealers to be looking for them ... nice! Looks like we'll be once again cleaning a rental and interviewing tenants. I swear it feels like we've been on an uphill battle for way too many years. Anybody have a pile of money they don't know what to do with?! I'm starting to think that "Money Doesn't Buy Happiness" stuff is a bunch of crap. If we were rich, we'd walk away from our rentals .. and buy a brand new boat! Sorry you didn't get to put your baby in the water. I hope it's very soon. Also sorry about the rental. I hope you find a good tenant soon. Always better to find that leak sooner rather than after the splash. You saved a ton of money finding it now. Being at the boatyard is a hard life. No pun intended. But it can't last forever. Keeping fingers crossed for a big splash in your life very soon! It sounds, save for the tenant issues, you're still enjoying yourselves and making positive progress towards fulfilling your cruising goals. 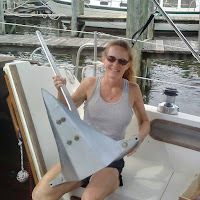 Ken has become intimately familiar with the boat in the process, which is always a good thing, It has been an interesting read following your progress. Good luck and I look forward to the time Nirvana is back in the water!